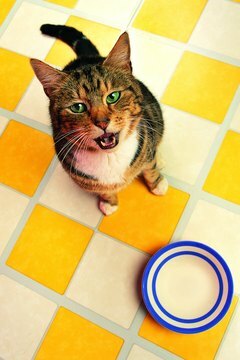 Cats are known to be carnivores and thrive on a diet that has a good supply of lean protein as part of it. Most of the lean protein that cats get in their diet comes in the form of chicken, turkey and fish in the commercially prepared dry and wet cat food they eat. Hamburger is a viable alternative to feed your cats as long as certain criteria are met. The hamburger should be: fully cooked; prepared specifically for them and not from table scraps; only given occasionally and not as a substitute for their regular meals; and supplemented with grains, vegetables and nutrients that cats need on a daily basis. Any hamburger cooked specifically for cats should be cooked until well done. Check the meat using an instant-read thermometer to verify that the meat's internal temperatures is at least 165 degrees Fahrenheit. Like humans, cats are susceptible to food-borne illnesses such as E. coli or botulism. Hamburger that is undercooked and falls within the temperature danger zone (41 to 140 degrees F) can make your kitty sick. Any hamburger that is given to your cats should be cooked specifically for them and not as leftovers from the dinner table. There are a number of foods that humans eat that are toxic to cats, such as onions, garlic and mushrooms. Ingesting these foods can cause your cat to get sick and even die. These are foods that are sometimes incorporated into hamburger used for human consumption, such as meatloaf or Salisbury steak. Cats should only eat hamburger cooked specifically for them. Any hamburger that is cooked for your cats should only be done occasionally, as the hamburger alone does not have the required nutrients a cat needs and also because cats get bored with their food easily and will stop eating anything that it is given on a regular basis. If you are interested in giving your cat ground meat and also want to keep your cat's interest, consider alternating between types of ground meat, such as adding ground chicken, ground turkey or ground veal to the rotation. Avoid ground pork because the fat content is too high in pork and may lead to intestinal issues. When cooking the hamburger (or any ground meat) for your cat, add ingredients that it needs to have to stay healthy. Cats have short intestines, so cooked grains such as oatmeal or rice, should be added to the hamburger to help it digest its food. Add a small amount of vegetables, such as carrots or peas, to the mix as well for added nutrition. For lean hamburger, add a small amount of oil like vegetable or fish oil. Most importantly, add a supplement that has vitamins and minerals, such as taurine, to the mix to keep your cat's health on track.